The New York Association of Realtors reports that sales were basically flat (282 versus 284) for Westchester County, New York in May compared to April. But the median price jumped from $590,000 to $610,000. As with the Miami existing-homes data, the rise in the median price could have resulted from a shift in the mix of homes sold. Look for confirmation from indices that track same-home sales (FHFA, S&P Case-Shiller) before concluding that home values are appreciating. As noted previously, the Case-Shiller index has indicated weakness for many months. The recently released FHFA index shows prices in decline as well (more on that in an upcoming post). And of course, the New York market remains monstrously overpriced relative to incomes (see posts from February 2010 and March 2009). 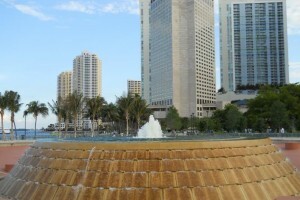 The Mildred and Claude Pepper Fountain at Bayfront Park in downtown Miami. 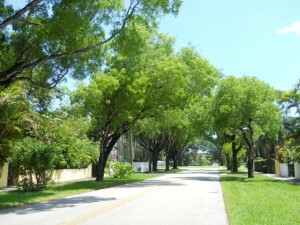 Existing Home Sales Fall Nationally, Rise Strongly in Miami, in May 2010. 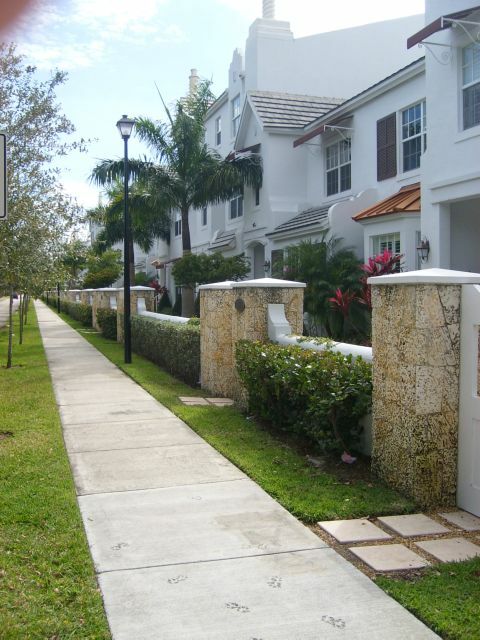 Median Prices Up Both Nationally and in Miami. Contrary to expectations for an increase in home sales from the homebuyer tax credit, the number of closings in May fell a modest 2.2% from April. That’s a disappointment for those expecting a big finish to the tax-credit incentive. Sales in Miami, however, rose strongly, from 592 in April to 727 in May — an increase of 23%. Sales are not the same thing as prices. Nationally, prices fared significantly better than sales, rising about 4.2% compared to April. Notably, prices have risen for three consecutive months since February, even as the homebuyer tax credit continued to stimulate low-end demand. During the months leading up to the initially scheduled expiration of the tax credit in November 2009, prices fell month after month. It is possible that the second-round extension of the tax credit, which expanded the eligibility limits, might have stimulated transactions at higher price points. But housing bears who predict another leg down for prices need to keep an open mind. In Miami, the median price rose from $192,000 in April to $196,700 in May, an increase of 2.4%. This is within the Miami market’s range over recent months. Data are from the National Association of Realtors and Florida Association of Realtors, and reflect sales from Realtor MLS data. Transactions are not limited to repeat sales of the same houses, and the price data are therefore subject to distortion from shifts in the mix of homes sold (more expensive versus less expensive). posted by // Comments Off on Existing Home Sales Fall Nationally, Rise Strongly in Miami, in May 2010. Median Prices Up Both Nationally and in Miami. The Housing Market Index maintained by the National Association of Home Builders and Wells Fargo posted a sharp decline in June. The index fell 5 points from 22 in May to 17 in June, one of the bigger drops on record, and the biggest since a decline from 14 to 9 in October-November 2008. But don’t read too much into the decline — yet. The index had surged through May, as the artificial boost from the expiring homebuyer tax credit worked its way through the system. So the current level merely reflects a retreat to the poor sentiment that prevailed before the government-induced surge. The index remains up sharply from the single-digit, Armageddon levels of November 2008 to March 2009. Keep an eye on the next few months. A level of 17 reflects despair. If the index breaks below 15, that would reflect a renewed sense of crisis. 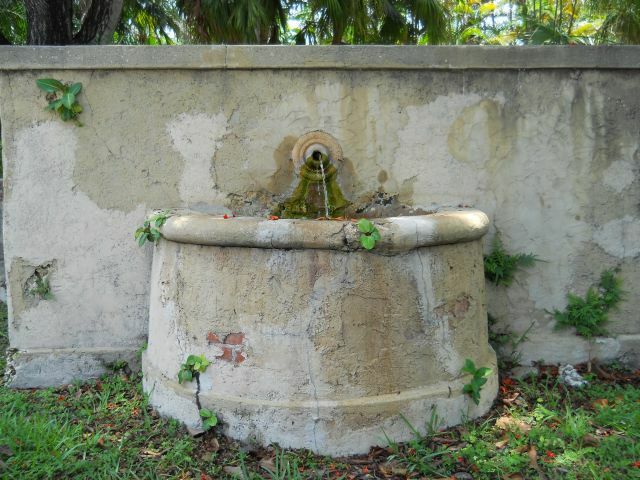 In April, the city commission in Coral Gables approved the city’s purchase of an empty lot at 4650 Alhambra Circle, to be used as a park. 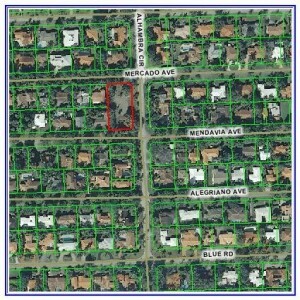 The lot is two blocks north of Blue Road, on the west side of Alhambra. Here’s the problem. The city paid $1,000,000 for the lot. The seller paid $950,000 in 2005, at the top of the real estate market. Does anybody think property values have risen since 2005? Not the county property appraiser, who puts the value at $635,760. The city, however, found its own appraisers to justify the million-dollar price tag. Seems it was more important to find vacant land, no matter how remote in time and space, than to consider comparables like the property at 4607 Alhambra Circle — a mirror image of 4650 occupying the same size and shape lot right across the street from 4650 Alhambra. The property at 4607 sold in 2008 for $1.855 million — with a 5351-sf house on it. And that was in 2008; the county appraiser says it’s now worth $1,325,535. But of course, none of this really matters, because Coral Gables wasn’t spending its own money anyway. This bailout was courtesy of county taxpayers. 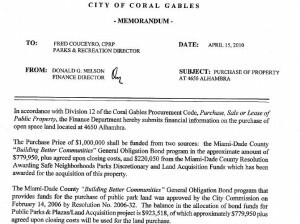 As everybody knows, Miami-Dade County has plenty of money to throw around for things like parks in Coral Gables. The biggest shame is that the would-be developer’s dreams were never realized. After obtaining approval to split the lot in two, the project never materialized. Thank heavens the good taxpayers of Miami-Dade County were kind enough to make this poor developer more or less whole. We can’t have people failing at the things they try to do. Then nobody would ever try to do anything. 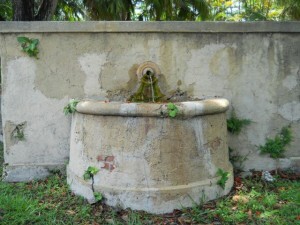 Fountain at Granada Plaza in Coral Gables (Granada Boulevard and Alhambra Circle), catercorner from the Country Club of Coral Gables property. Yes, flopping, not flipping. 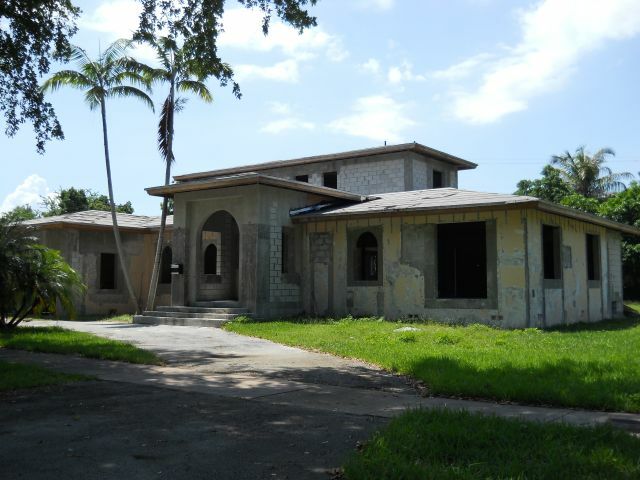 If you follow real estate in Miami and Coral Gables closely, you’ll see the occasional short sale that’s too good to be true. The price is not just cheaper than the mortgage balance, it’s much cheaper than its current market value based on comparable property sales. A Bloomberg news report suggests you could be looking at a home flopper, the latest mutation in the endless evolution of mortgage fraudsters. Instead of convincing banks to lend too much for a property, today’s fraudster convinces banks to release properties for too little, often using a “broker price opinion” rather than a full appraisal. Then the buyer turns around and sells for more than the below-market price the bank accepted. I can think of a few transactions that might have been flops. When a short sale is listed way below market value, the listing agent doesn’t return calls for showings, and the property goes under contract in a couple of days, you have to wonder. A government handout program that lacks necessary antifraud programs. What a surprise. 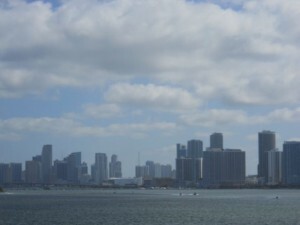 According to the Case-Shiller Home Price Index for the three months ending March 2010, home prices in Miami were essentially flat compared to the prior month’s reading. On a seasonally adjusted basis, the index rose from 147.23 to 147.27, a statistically meaningless change. Without seasonal adjustments, the index fell from 147.52 to 146.15. Another reference point, the New York market, fared about the same. The seasonally adjusted index fell slightly from 170.98 to 170.73, and the non-adjusted index fell a bit more, from 170.57 to 169.42. House Price Index Update — New York and Miami, The Real Estate Fountain, Sept. 4, 2008. 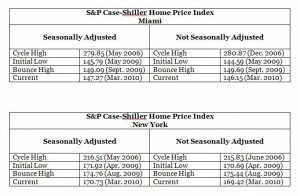 House Price Index Update — Miami and New York, The Real Estate Fountain, Feb. 10, 2009. Another characteristic of real estate busts is that prices typically bounce from an initial low before sinking to the final low. This cycle is shaping up true to form. 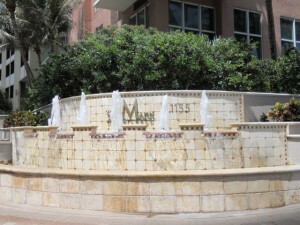 Fountain at The Mark condo, 1155 Brickell Bay Drive, located on Biscayne Bay in the Brickell neighborhood of downtown Miami.